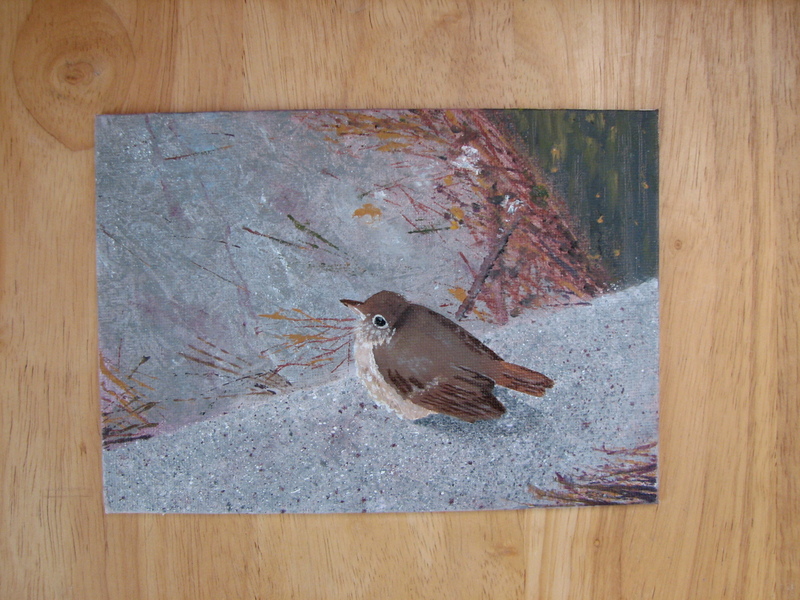 On day two following my intention to paint everyday, I began a small oil painting of a sweet little bird I spotted on my back door stoop. Photos taken though multiple door windows. It was searching for bugs (I suppose). 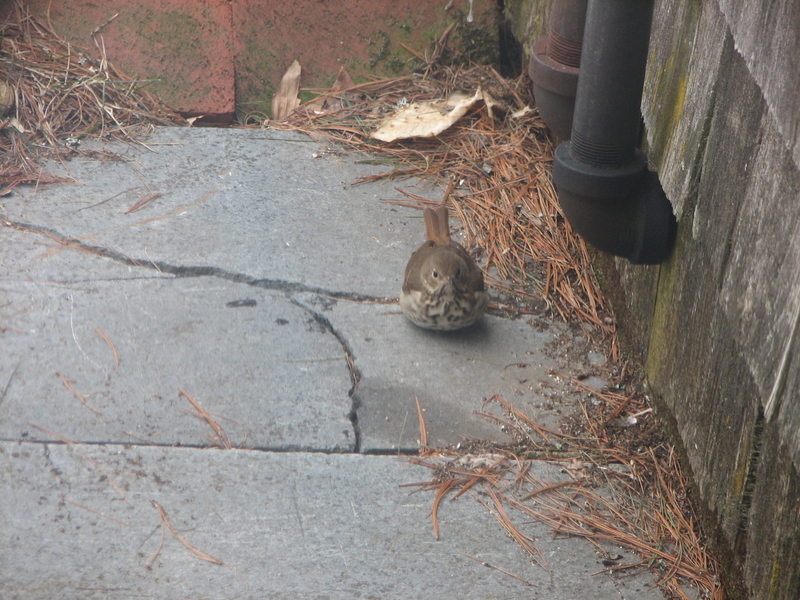 The ground was mostly snow-covered and this was one of the few bare spots. 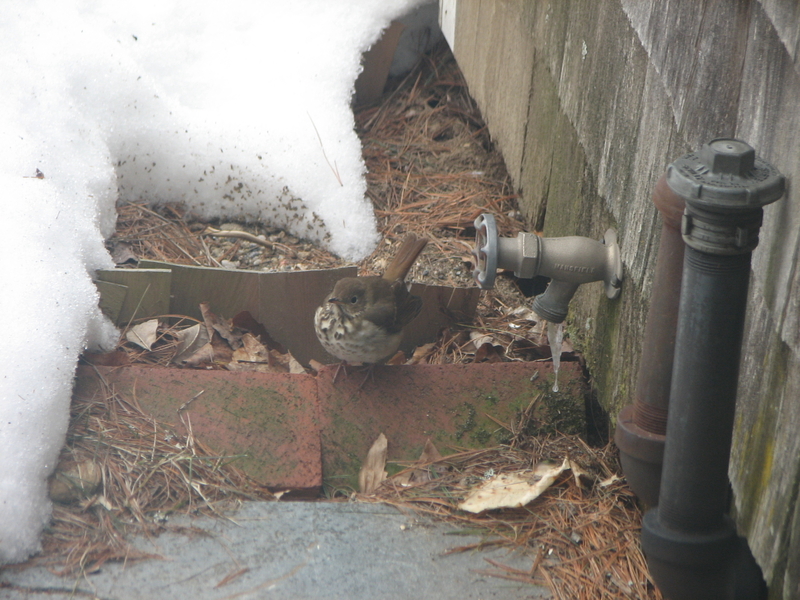 I didn’t recognize the bird – looks like a warbler, perhaps the yellow-rumped or cape may. I thought it was probably migrating and had stopped for a rest. I didn’t finish this painting in one day, and in fact it still needs some finishing touches and better definition of the pine needles. I would have loved to paint the pipes and frozen drips, but that would have been a disaster in the making. I’m finding it stressful painting in oil, and I needed a break. I’m trying to persevere through the stress, hoping to come out the other end more confident. Sometimes I think this is silly – that it is better to do what comes with more ease. I find it especially difficult to paint thin detail lines in oil. I wonder if I haven’t found the right brushes yet [she said hopefully]. If anyone has some hints in this regard, I’d accept them gratefully. Categories: Artwork, Oil Painting, Painting | Tags: brushes for oil painting, cape may warbler, warbler, yellow rumped warbler | Permalink.